Lacy's 2.59 yards per carry was the lowest in the league this season among players with at least 50 rushing attempts, as he was arguably the NFL's worst running back. Lacy is inactive for Sunday's game against the Cowboys, the Seattle Times reports. Analysis: With Lacy a healthy scratch Sunday, the Seahawks will roll with a Week 16 backfield comprised of Mike Davis, J.D. McKissic and Thomas Rawls. Lacy (coach's decision) is inactive for Sunday's contest at Jacksonville. Analysis: The absence marks the third time the Browns have deemed Lacy a healthy scratch. More than likely, the Seahawks will rely on Mike Davis as the lead back and J.D. McKissic for obvious passing downs, but Thomas Rawls will be around to spell the duo. Lacy had a three-yard run during Seattle's 24-10 win over the Eagles. 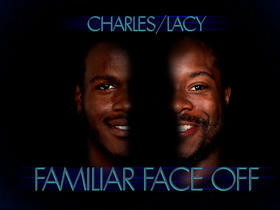 Lacy ran for 46 yards on 17 carries and added three catches for 15 yards during Sunday's 24-13 win over San Francisco. Analysis: Sunday was Lacy's heaviest workload of the season by a full eight touches and was the first time since Week 7 that Lacy cracked double digits in touches. Seattle is in a predicament as it needs a consistent running threat outside of quarterback Russell Wilson. The team certainly leaned heavily on Lacy on Sunday, but is his sixth straight game of under 3.5 yards per carry enough to keep J.D. McKissic off the field? Head coach Pete Carroll suggested to Danny O'Neil of 710 ESPN Seattle that Lacy will start at running back Monday against the Falcons. Analysis: The Seahawks have made Thomas Rawls a healthy scratch for the second time this season, leaving Lacy, J.D. McKissic and Mike Davis as the only RBs on the active roster. Among the trio, Lacy is the best bet for work on first and second down and perhaps at the goal line. If he can't muster more than his 2.7 YPC on the season, though, Seattle's ground game may continue to sputter outside of Russell Wilson. Lacy (groin) was absent from Saturday's injury report and is in line to play Monday night against the Falcons, John Boyle of the Seahawks' official site reports. Analysis: Lacy missed last Thursday's win over the Cardinals with a groin injury but is now set to return to the field Monday night after logging full practices throughout the week. While he could take over starting responsibilities from Thomas Rawls, it seems more likely that the pair will split carries considering they're both averaging around eight carries per game this season. Lacy (groin) logged a full practice Friday, Michael-Shawn Dugar of SeattlePI.com reports. 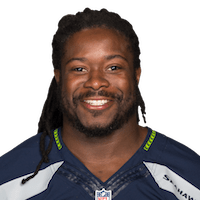 Seahawks head coach Pete Carroll said that Lacy (groin) should be available for Monday's game against the Falcons, John Boyle of the Seahawks' official site reports. Lacy (groin) has been ruled out for Thursday's game at Arizona, Bob Condotta of The Seattle Times reports. 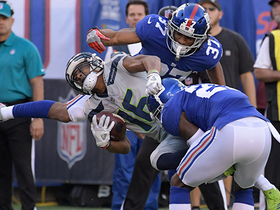 Analysis: Lacy's inability to practice during a short week forced the Seahawks' hand. The absence will mark his third of the season, allowing Thomas Rawls to serve as the lead back Thursday. Throwing a wrench into Rawls receiving most of the offensive snaps out of the backfield is the return of C.J. Prosise, whose pass-catching prowess could keep the former contained to a two-down role. Lacy (groin) didn't participate in Tuesday's practice. Head coach Pete Carroll said Monday that he doesn't "know yet" if Lacy (groin) will be active Thursday at Arizona, Gregg Bell of The Tacoma News Tribune reports. Lacy injured his right groin Sunday against the Redskins and is doubtful to return, John Boyle of the Seahawks' official site reports. Analysis: Given the first shot to lead the Seahawks backfield, Lacy turned six rushes into 20 yards and reeled in his only target for 14 yards. His second-quarter departure paved the way for Thomas Rawls and J.D. 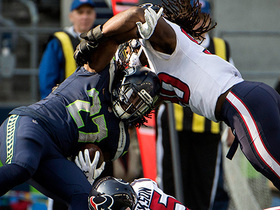 McKissic to pick up touches, which will likely continue until the end of the game with C.J. Prosise (ankle) absent once again. 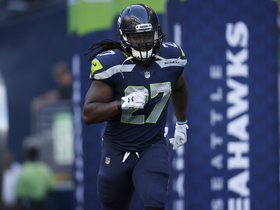 Head coach Pete Carroll and offensive coordinator Darrell Bevell both suggested that Lacy will serve as Seattle's featured back Sunday against the Redskins, Bob Condotta of The Seattle Times reports. "We're going to start with Eddie and let him go a little bit and see where it goes from there," said Bevell. "Going to see a lot of Eddie this week," Carroll said. 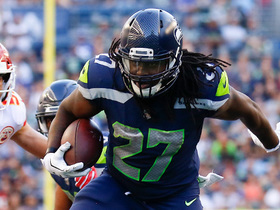 Seahawks coach Pete Caroll said Lacy will be prominently featured in the game plan Sunday against the Redskins, ESPN.com's Brady Henderson reports. 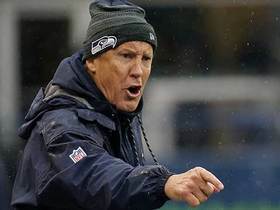 Seattle Seahawks head coach Pete Carroll gets animated after a penalty. Seattle Seahawks running back Eddie Lacy is tackled in the backfield for a loss. 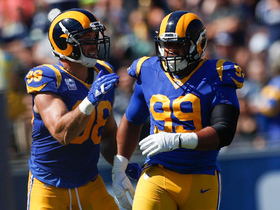 Los Angeles Rams defensive tackle Aaron Donald stops Seattle Seahawks running back Eddie Lacy in the backfield. 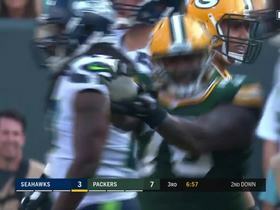 Green Bay Packers defensive end Mike Daniels stuffs Seattle Seahawks running back Eddie Lacy for a loss of 3 yards and then does a "Street Fighter" celebration. 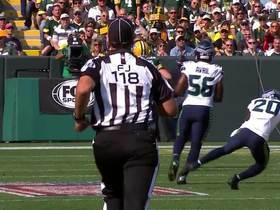 Seattle Seahawks cornerback Jeremy Lane gets ejected after a scuffle. 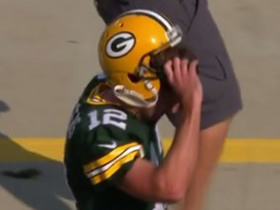 Green Bay Packers quarterback Aaron Rodgers throws down his helmet after an interception in the first quarter. "NFL GameDay Morning" analysts choose their favorite super hero for Week 1. NFL Network's Kay Adams explains why Seahawks running back Eddie Lacy is the one thing to watch for in Seahawks vs. Packers Week 1 matchup. The "Good Morning Football" crew debates who will have a bigger impact for their new team this season between Broncos running back Jamaal Charles and Seahawks running back Eddie Lacy.